The email from the prime minister’s office offered a story with strings attached. For two Ontario journalists, the conditions seemed unreasonable. On June 17, 2013, the office of the Prime Minister (PMO) had a story they wanted Canada’s media to tell. Media representatives from the PMO of Stephen Harper reached out to dozens of publications claiming they had documents that were unflattering to Liberal party leader Justin Trudeau. Trudeau had a long history of doing paid speaking engagements across Canada, including a fundraising event for a seniors’ facility in Saint John, New Brunswick and a local community college in Barrie, Ontario. The only catch was the PMO wanted to be listed as an anonymous source in any stories written on the documents. This was a bizarre position for reporters of any political stripes to be put in for a number of reasons. Within hours of being contacted the Toronto Star’s senior political writer Susan Delacourt and the Barrie Advance’s news reporter Laurie Watt, both journalists with careers that spanned decades, produced two completely different stories. 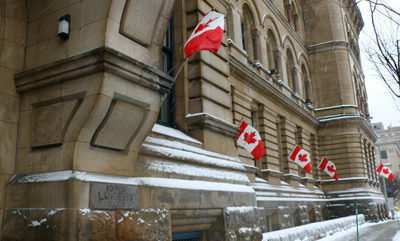 This case study follows each of the two journalists — one in Canada’s largest big-city paper, the other in a small city just an hour’s drive away — as they decide to deal with the uncomfortable position imposed on them by the Prime Minister’s staff. At its heart: what does “off-the-record” mean when the source is the most politically powerful office in the land? 3. 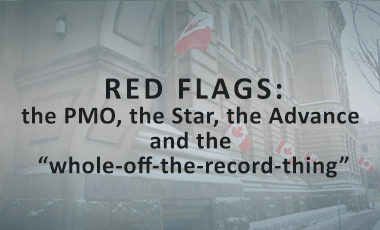 The PMO: Partisan or no?